I picked up a free NFL Blitz dedi cab yesterday and it currently has no neck glow. I pulled the chassis and have noticed a few issues already. I wanted to start off saying I checked the fuse as well as the HOT and both test good. R728 is fried and got so hot it charred the solder. 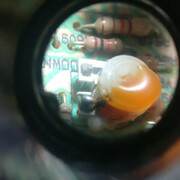 Q708 appears to have gotten so hot that the solder melted and has a cold solder joint. I haven't tested the NPN transistor yet, but I did look up the part and is obsolete. Not quite sure what to replace it with if the transistor is bad. There is what looks like a resistor and looks like it's R759 on the screen print on the PCB, but I'm unsure. That resistor looking thing has cracks all through it and the schematic doesn't have the ohm in it and tested it with a DMM and get .6 ohms. Is there anything else I should check and does anyone have a cap list for this chassis? I plan on ordering a cap kit using Panasonic caps as well as a new flyback. The flyback has a weird plastic box with epoxy in it and a black wire coming out going to the chassis frame which I would assume is ground. 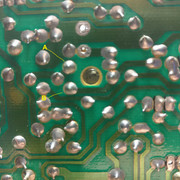 R728 is the resistor through which the b+ supplies the horizontal drive transformer T701. If the transformer isn't supplied the monitor doesn't work. 2W sounds a little low, I would upgrade to 3W or 5W. 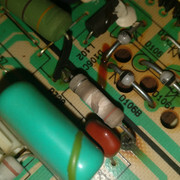 The cracked component is not a resistor but an inductor, L704 0.82uH. The horizontal signal to the HOT passes through this component. If it's bad the monitor doesn't work. It's not open as your resistance reading shows but it looks in bad condition and it's advisable to replace it. 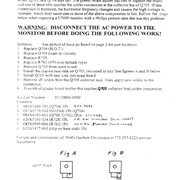 Q708 shouldn't be replace unless a test out of circuit says it's bad. Thanks for the help. I looked up that inductor on digikey and can't find a .82 uH. Everything I see is at least 1.00uH and above. Do you happen to have a link to what I would need to replace the inductor with? I'm having troubles testing this transistor as I'm getting confused. I haven't tested too many transistors and it seems the pinout for the c2482 is different than most so when I go to follow along with a video I get mixed up. I didn't until you passed the link along. Thanks! =) I saw in one of his logs he said that q708 was shorted and to test R760 as his was open. R760 was giving off a weird ohm reading in circuit so I lifted one of the legs and retested. It's wide open. Strange thing is the color bands for it are Yellow, purple, brown, gold which should be 470ohms. However, in the schematic it says it should be 100ohms. 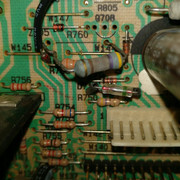 Not sure what resistor is supposed to be in there?? Any help would be greatly appreciated so I can order the correct part when the time comes. 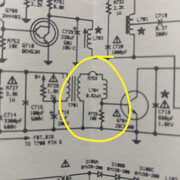 I've been noticing some inconsistency between the schematic and what's on the PCB. He also said his T701 was dead and I'm not quite sure how to test it and if it's dead what to order. The transistor readings will probably be higher (0.6V) but it doesn't matter. Only B-C and B-E will give you reading, the other four possible combinations will give no readings. Q703 is the same so you can compare. Thanks for the links and the help. B-C I get .109 E-C I get .606. I get a reading no matter how I flip the leads. The only way I get OL is if I put the red lead on E and the black lead on B. That would mean the transistor is bad right? I looked on eBay and it looks like a bunch of counterfeit parts and not sure what a good substitute would be. If it was tested out of circuit, then it's bad. That's correct in saying it was tested out of circuit. Thanks for the link and help! I'll be buying a few of those transistors and a flyback from that website. As for R760 should I go by the schematic or the color bands of the resistor that was already in the PCB? Post a pic of the whole chassis. 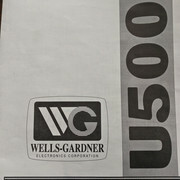 I'm not sure if it's a U5000 or U2000 (R760 is 470 on the U2000). I looked at a u2000 schematic and it looks like R750 is 470ohms, but R760 says OPT and doesn't give a value. EDIT: Just did a search and P-738 means it's a U5000 Chassis. This is the schematic that came with the arcade machine. At least what was given to me when I picked it up. This chassis was attached to a 25" monitor and I can tell this has never been worked on as the silicone was still attached to the neck board sealing it to the neck of the CRT. And that's what you have on the chassis but it's important that you use a *flame proof* type, not carbon film. I ended up noticing that on their website as well. Very strange... Even their "parts list" says 100 ohm. I'm guessing there were different versions of the schematics where they made changes and the paper one I have as well as another PDF version. I added 470 ohm 1 watt metal film resistor to my cart and will be making the order on the 15th. 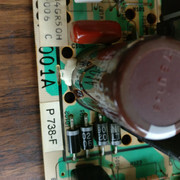 I'm also going to replace C720 because it was touching the resistor that burned up and it burned that brown cap too. 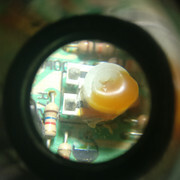 Here is the Cap I'm replacing it with https://www.digikey.com/product-detail/en/1930032 It may be a while until I report back as I'll be waiting to receive the parts and will have to install them. I checked out their troubleshooting guide for the chassis and in the meantime I'm going to test the parts on that list as well. Thanks for the help and I will report back if I find anymore bad parts or if I get it working. Link doesn't work. Cap is probably good. Figured I would change it out since the burned up resistor charred it. Ya so I figured I would change out the caps I had on hand c730 had glue all over it and under it. I tried cutting the glue with an exacto knife and cracked the HV shutdown potentiometer leg.... Not sure what to do now and I'm pretty pissed right about now. Any idea on how to repair this? 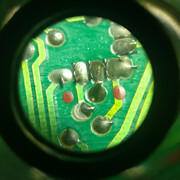 EDIT: I scraped away the black mask over the traces of the potentiometer and took a cut lead from one of the caps I installed and bridged the gap trace to trace. Not sure how this will hold up, but I get 4.314k ohms now. I didn't have a resistance when it broke so it looks like it was successful. Is it possible to just jump the leads on the bottom of the board for this to be more reliable? 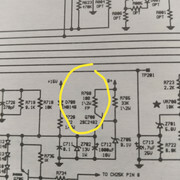 If I make a jumper from point A to Point B with wire I'm guessing that if my bridge on the top of the potentiometer fails the other leg of the potentiometer is intact and would just be grabbing the resistance from the other leg. 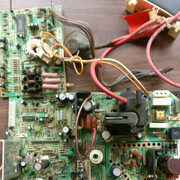 I would get readings from the damaged trimmer and then get a new one and adjust it to the same values. 1 turn. Also, it's important to choose one that fits the mounting holes. Well looks like I got the monitor working. However I get a blank white screen and not sure what the problem could be. Video amplifiers (Q503, Q504, Q505) not working. They may not be supplied with 180V (video B+) on the collectors and/or 12V on the bases. If there's no video B+, check R310, D310, C310. Could a dead game board possibly do this as well? It seems as though the Blitz led's on the board are not lighting up the way they should and I had a bad power supply that spiked high when adjusting the voltage. I now have a new power supply and all of the led's stay on and I don't hear the HDD doing anything anymore. I only have a Mortal Kombat 1 board to test which is standard res and this monitor looks to be medium res. It's dual res (15-25KHz) selectable with the connectors in the middle of the chassis (CN15K or CN25K). Alright I'm back. I have some good news and some bad news. The reason I wasn't getting a picture is because the blitz PCB was bad. Monitor turned on perfectly fine got the game to show up on the monitor and noticed the horizontal height needed adjusted. I smelled a little something, but thought it was just my imagination. I turned the knob a little on the remote board and come back around the back to see smoke coming from the the area of where that burned up pad is with R728... Not sure what the heck is causing that. 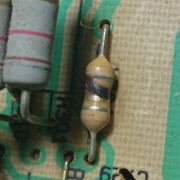 It seems the issue where the resistor charred up and took out the other parts is still there and is most likely why the monitor failed in the first place. I hurry up and shut the game down. I'm going to discharge the tube today and pull the chassis and see if I notice anything out of the ordinary. Any clues? Well not sure if anyone is still watching this or not, but I accidentally ordered a 1000pf cap for C720 instead of 100pf. Quite possibly where the smoke was coming from. I also plan on ordering new large wattage resistors that were getting hot and burning the pad to space them away from the board more so the PCB isn't getting as hot. Going to have to wait until I get some extra cash to make another order. Your best source for high quality arcade parts!!! BTW: we stock every part on our site that you are looking for in the entire thread. Thanks for the reply security0001. I think I may have found out what the issue is. I may be missing an upgrade kit for this chassis which is causing R728 to burn up. Do you happen to have the parts for the horizontal upgrade including the heat sink? It's the first page in the PDF I've attached. PS. If I'm reading the upgrade kit correctly R760 used to be 470k, but should now be replaced with a 100 ohm resistor? I'm a little confused. Awesome. I'll be sure to shoot you an email on the site. I've included the PDF as an attachment in my last post. You should be able to see the upgrade kit sheet there. A 470 ohm was already in the board and dead and what it seemed like it said was to replace to with a 100 ohm, but I'm not sure. Let me know what you take from it. Should be the first page in the PDF. I've included a picture to make it easier for you. Page created in 0.32 seconds with 49 queries.